With all the doom and gloom surrounding beer tax it's always nice to hear some good news emerging amongst the bad. A figurative Phoenix from the flames, so to speak. As such, despite being a little late to the party, I want to say welcome back to Beer Ritz in Leeds. When news surfaced that Beer Ritz in Headingley (just outside Leeds centre for non-locals) had suddenly and unexpectably closed, I was shocked and annoyed in equal measures. Firstly I felt bad for Zak and Ghostie, and everybody else invovled in Beer Ritz, and couldn't believe that such a popular place could be closing down just as craft beer is emerging from the underground into mainstream consciousness. My second thought, on a personal and completely selfish level was 'Where the hell am I going to get all my decent beer from now?'. Zak explained exactly what happened on his blog, but essentially there was a business structure issue which meant they were advised to cease trading immediately. Thanks to a management buyout the problem has been rectified and Beer Ritz is open for business again and back for good. 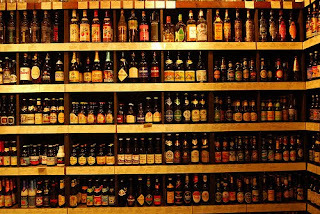 For those of you that live anywhere even close to Leeds and haven't yet visited this craft beer treasure trove I suggest you give yourself a quick slap, empty the boot of the car and prepare to visit one of the best beer shops in Britain. 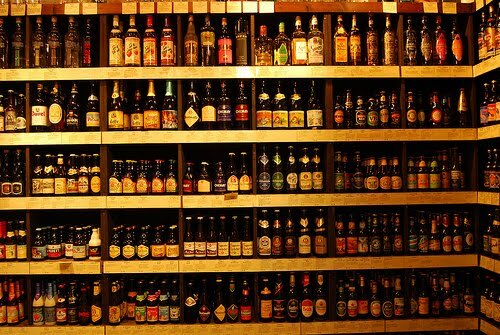 The range of beers on sale is staggering and particularly for American Craft beer, Belgian Beer, UK microbrewery and UK craft beer they are unbeatable on their selection. It really is the best place to buy good beer I've ever been. Just a cautionary note though, pay the mortgage first as you are going to want to buy a lot of beer when you visit this place, as leaving with any amount of beer less than more than I probably should will feel like a missed opportunity.